Lock in a great price for DIT Evrika Beach Club Hotel - All Inclusive – rated 8.7 by recent guests! The place was very nice and the room basic but well laid out. The food was excellent with lots of choice. the choice of all inclusive drinks was large and the staff where very polite. The hotel is very well located and I especially liked the free use of the sun beds on the beach and the added beach bar which was also all inclusive. The food was good and varieties could be found. Restaurant staff very nice. Room and hotel in general was quite clean. Team at the reception couldn't help about the area. Said that they didn't know?! Nice small aqua park. Nice room design. Prety good location. DIT Evrika Beach Club Hotel - All Inclusive This rating is a reflection of how the property compares to the industry standard when it comes to price, facilities and services available. It's based on a self-evaluation by the property. Use this rating to help choose your stay! Located next to the sea, DIT Evrika Beach Club Hotel - All Inclusive is located in the Northern peaceful part of Sunny Beach resort. It features beautiful sea views, air-conditioned rooms, 5 restaurants, 2 outdoor swimming pools, own indoor Aqua Park and several entertainment facilities, as well as a Premium Club with exclusive services. Central Sunny Beach is 1,650 feet away. Free WiFi is available in all areas. Each room is nonsmoking and features a balcony with views of the surroundings and a seating area with cable TV. The private bathroom is fitted with a shower or a tub, free toiletries and a hairdryer. A free of charge safety deposit box is featured. An outdoor amphitheaters offers night entertainment. Several souvenir shops and a mini market can be found on site. For children there is a children's playground and also a children's pool, and a climbing wall is also available. A fitness center, a tennis court as well as social activities such as darts and karaoke are available for free. Upon request and a surcharge, massages and billiards can also be arranged. Guests can relax on the terrace in the garden area, or at one of the 4 bars including a beach bar. The on-site restaurants serve either buffet or a la carte meals, and dishes from the Asian, Italian or Bulgarian cuisine. A snack bar is also featured. The bus station is only 50 feet away and the old town of Nessebar can be reached in 2.5 mi. Burgas Airport is 22 mi away. The property can also organize airport transfer from Varna and Burgas airports upon request and at a surcharge. 뀐 Located in the top-rated area in Sunny Beach, this property has an excellent location score of 9.3! When would you like to stay at DIT Evrika Beach Club Hotel - All Inclusive? Opening to a furnished balcony or terrace with garden view, this air-conditioned room features a seating area, a flat-screen TV with cable channels and a refrigerator. The private bathroom comes with a shower. This room type is set on the main building. Air-conditioned room located in the main building with a furnished balcony and garden view, a seating area with a flat-screen cable TV and a refrigerator. There is a decorative wall between the double bed and the children bunk bed. The private bathroom comes with a shower, free toiletries and a hairdryer. Please note that children older than 11 years old are considered as adults. Air-conditioned room, featuring a furnished balcony, a flat-screen TV, a refrigerator and a private bathroom with a shower. Please note that this room is set on the main building. This air-conditioned room features a furnished balcony or terrace, a refrigerator, a sofa and a bathroom with a shower. A flat-screen TV with cable channels is provided. Please note that this room type is set on the main building. This twin room features central air conditioning, a sofa, a furnished balcony, a flat-screen TV with cable channels and a private bathroom with a tub or a shower. Opening to a furnished balcony or terrace, this air-conditioned room offers a flat-screen TV with cable channels. The bathroom is fitted with a shower. Opening to a furnished balcony, this air-conditioned room features a flat-screen TV with cable channels. The private bathroom is fitted with a shower. Opening to a furnished balcony or terrace, this air-conditioned room features a flat-screen TV with cable channels. The bathroom is fitted a shower. This room is set in the main building. Opening to a furnished balcony, this room features central air conditioning and a flat-screen TV with cable channels. The bathroom features a shower or a tub. Please note that this room type is only available in the main building. We most heartily welcome you to Evrika Beach Club Hotel – a true paradise on the Southern Black Sea Coast. Only here you have the opportunity to enjoy your unforgettable vacation! Only we offer you: • the best location in Sunny Beach – directly on the beach, in the Northern most peaceful and luxurious part of the resort • the only club hotel in Sunny Beach – for a true family vacation • the largest complex area in Sunny Beach – the hotel extends on a plot of over 60000 m2 • the most beautiful sea view – to Nesebar, Sveti Vlas and the mountain • private beach with free sun loungers – the only one in Sunny Beach • own indoor aquapark – with separate areas for adults and for children • All Inclusive beach bar – the only one at the Southern Black Sea coast • the largest number of restaurants and bars in an All Inclusive complex in Sunny Beach – 5 restaurants and 5 bars • over 60% of the hot food in the Main Restaurant, Snack Bar and Italian Restaurant is prepared on spot in front of tourists We will do our best to make all your special wishes come true! Feel at home in the best club hotel in Sunny Beach! House Rules DIT Evrika Beach Club Hotel - All Inclusive takes special requests – add in the next step! Very unpleasant staff. Very unwarm greeting. At the bars it seemed they are counting hours till the end of season (except for bartender Filip). We have 3 kids and took family room. At the reception we were demanded to pay extra for the infant. I was shocked. And a baby cot we received only on 3rd day although I had asked it when booked the room. Not safe bunk beds - my doughter (5 years) fell off of it. If you are out of toiletaries, you have to ask it to the cleaners. They don't see it. And if you ask for more shower gel, don't be sure they will notice that you are out of soap as well. Aqua park is working only 4 hours a day - 10-12 and 15-17. Beach towel change only 1 hour a day. Boring kitchen. And 2 of 3 optional restaurants were closed at the middle of our stay and we didn't manage to make a reservation we would like to use. Restaurant was a walk from Block D, in fine weather that's ok. Bar in evening lacked atmosphere. Our sea view room was to the side, would have preferred a front facing room as we were overlooking the casino roof. Most of the staff unfriendly and bit rude Couldn’t be more clear when booking that I wanted a double bed and got two singles and was told there was nothing they could do about it when I told reception. Rooms are nice but long worn in Block C. We had a view from balcony to parking - quiet, but not what we expected "with garden view room". We had twin beds in room, whether chose large double bed when made booking - had to push them together as our son liked to sleep with us. The shower has no door (not cabin) only curtain and the divided by 5cm cement border on floor wasn't enough to keep water in shower - after each shower bathroom floor is wet and toilet is just opposite the shower, so there's waste of towel to clean the floor - get longer curtains for shower at least! Restaurant had many cracked tea cups and soup bowl - check them regularly and throw out broken ones - it's disappointing. You get better service once you leave tips - good bar staff. Great location with own beach with free sunbeds and all inclusive beach bar. We enjoyed aquapark (10.00 to 12.00 and 15.00 to 17.00 - really was enough time), aquaerobics 11.00 and 16.00 every day (two girls and guy with "Vogue" tattoo does the class) and pools are nice and big. Animation team has day off every Thursdays, but aquapark operates normal times. Pool towel can be changed every day at pool between 16.00 and 17.00 - which is ok at the end of the day. Pool bar 10.00 to 18.00 and Snack bar by the pool (food served 12 to 17.00) with hot dogs, burgers, pasta, pizza, fruits and cold meats and vegetables choice. Full Lunch available in main restaurant 12.00 till 14.00. Breakfast in main restaurant 7.30 till 10.00, and for those whom late 10.00 to 12.00 in Bulgarian restaurant. Good variety of food in main Restaurant 18.00-21.30: sometimes very tasty, sometimes bit dry so so, but all depends on what you like and what you choose. We went to all 3 thematically restaurants (bookings made at breakfasts restaurant entrance between 8.00 and 10.00 every morning), most liked Bulgarian - all we tried was delicious - buffet type; Italian had great main dishes from menu and appetizers from buffet, but starters lack, Asian had great starters option, but mains were more European than Asian. 5 bars on the premises. Nicest and newest is D sector with sea view. No visitors allowed to hotel - security very strict on those who enter the building. Reception staff is very helpful. Reception and lobby bar looks newly renovated, as well as block D (seaside) looks newly build. Two playgrounds on the grounds for kids + kids club (which we haven't visited). Mini Kids disco at 19.30 and Adult entertainment at 21.30 every evening except Thursday. We recommend this hotel, but choose block D with Seaview - the new building is worth the money. Mid-September was pretty warm temperature, warm water in sea, swimming pools few mornings was cold. Bathroom drainage smell, Water slides open only twice a day 2 hours each time, one slide for adults only in afternoon. Tv chanells are limited to russian, bulgarian, euronews, german. They took off AXN, no romanian or hebrew even if many guests are from this countries. beach is clean, room cleaning, food. No elevator in the old building. 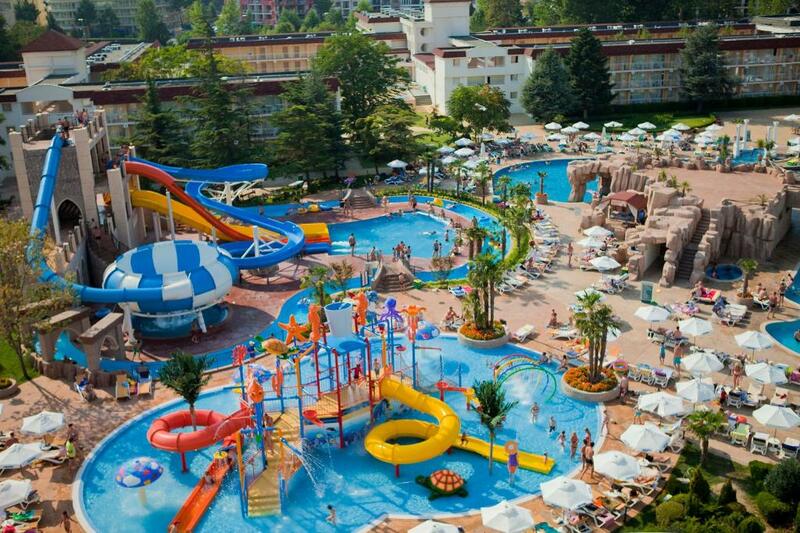 Aquapark, acces to the pool and seaside. We asked for side by side rooms but the customer care at the front desk didn't even try to help us. The food on the breakfast was the same and quite doll. The water in the children pool was very cold. Crowded swimming pool, if you do not wake up early you will not get a place close to the swimming pool. Wonderful vacation! Second time here, almost everything was great. The thematic restaurants are amazing!